Salve and smit are preparations applied to live sheep, while smorring was a dressing applied to woollen sails to reduce air permeability. All three products were traditionally mixed with varieties of animal fat. 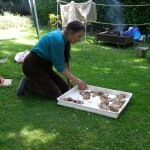 This has led to a re-appraisal of the highly comminuted cattle long bone fragments found on archaeological sites, popularly referred to as “soup kitchen” waste, as a possible source for the necessary fat and emollient for such mixtures, prior to the ready availability of cheap imported butter, fish and whale oils in the 19th century. A small-scale trial empirical study has been undertaken to examine the plausibility of this suggestion. The Architectural and Archaeological Society of Durham and Northumberland assisted with the trials, as an outdoor society meeting held at the Botanic Garden in Durham. 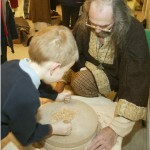 The event was viewable by members of the public, who expressed interest in the proceedings. Chopping raw cattle leg bones – spectator sport only! Sorting the cooked bone fragments for identification and comparison with archaeological finds. 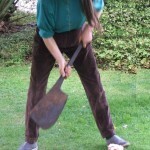 A range of fundamental activities were essential for daily life in the past. 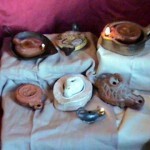 Examples are Lighting, Textile Production and Bread Making. There are also seasonal activities, such as making Pace Eggs at Easter time, and specialised activities, such as Writing. 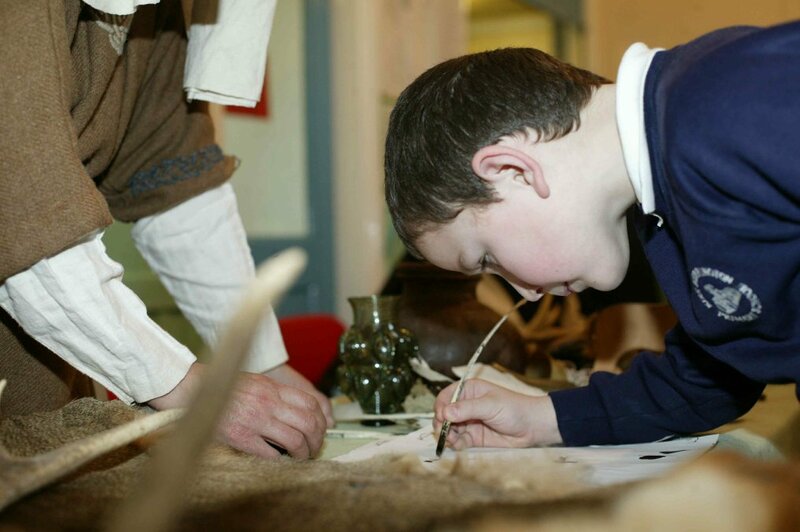 These topics are usually explored in each individual time period that we cover but can also form the basis of stand alone events, exploring how ways of dealing with the subject evolved through time. 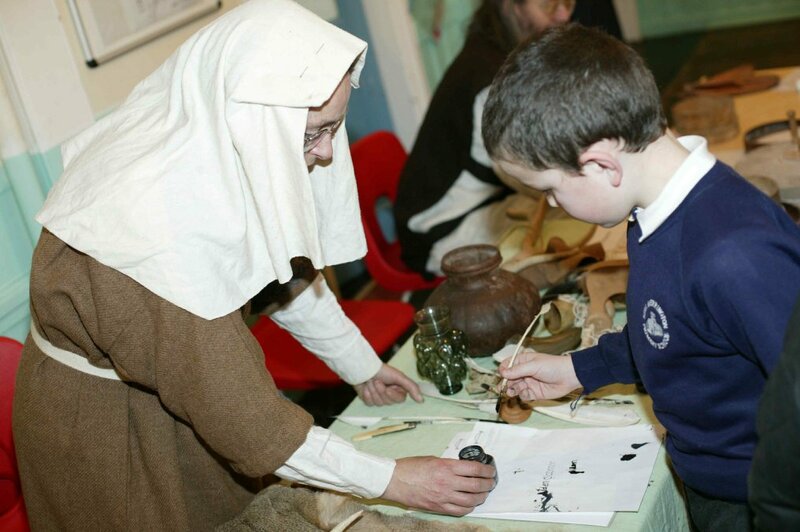 We invite the audience, whether a school class or the general public at a heritage monument or event, to try their hand at a craft activity. 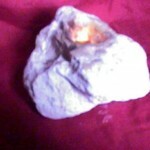 Lighting needs a venue that is ventilated and does not have smoke alarms. A room that can be darkened gives the best effect. 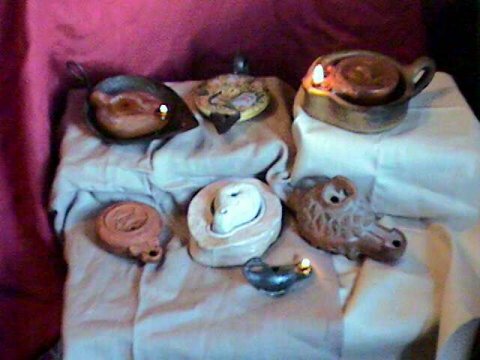 Our lights progress from a crude lump of chalk holding fat and a wick to the oil lamps of the classical world, the rush lights and tallow dips of the poor, the beeswax candles of the church and the wealthy and culminate with the paraffin wax candles, oil lamps and carbide lamp of the early twentieth century. 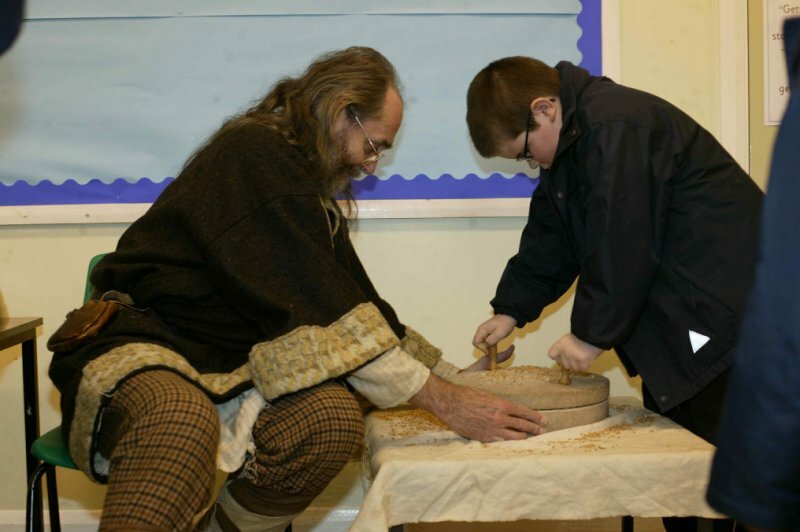 The activities can include peeling the rushes for rush lights, making clay oil lamps, dipping candles and making the slush lights of the Wild West. Textile Production centres on spinning wool, usually with the drop spindle. For centuries this was the work of every woman, hence the term spinster for an unmarried girl. Fleece from our own Manx Loghtan and Hebridean sheep is used for spinning. 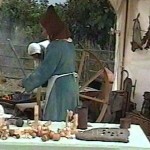 Besides wool, we also look at all the processes involved in producing linen from flax. 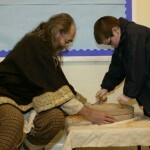 The audience can endeavour to extract the fibre from the flax stalk. Simple cords can be made with the lucette, the fore runner of the french knitting bobbin or wooden cotton reel of the twentieth century. Sprang is a technique of interlocking vertical, or warp threads, to produce items including hair nets, girdles and bags. Tablet weaving produces a strong but decorative band used for edging garments, making girdles and hair bands. 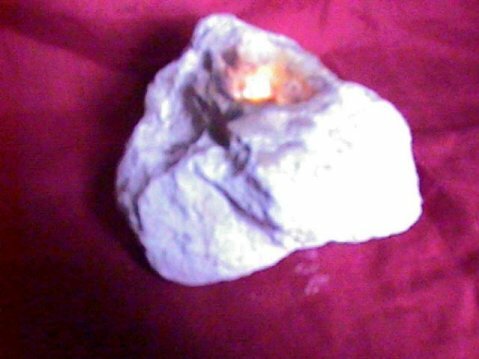 Bread was the Staff of Lif e, but leavened wheat flour bread was not available for poorer people. We explore the options of oatmeal, barley meal and maslin. 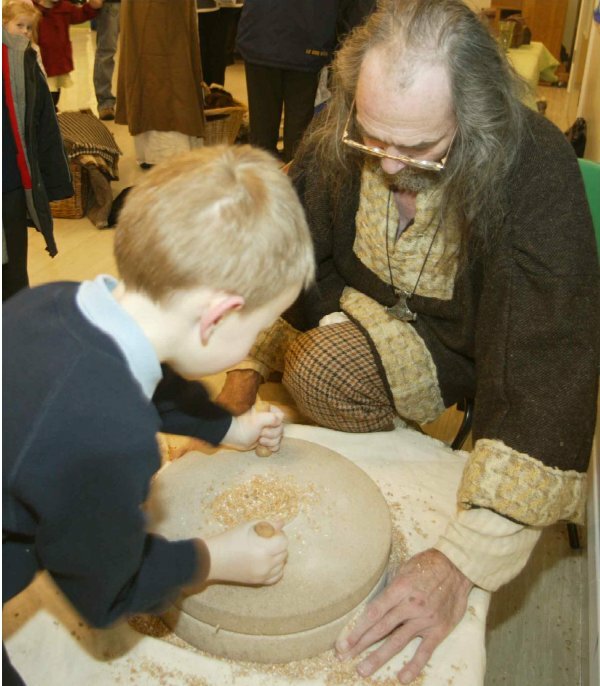 Children, in particular, can have a go at grinding wheat into flour with the quern and kneading dough in the dough trough. 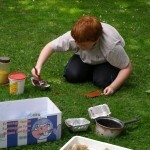 If the venue is suitable for a longer term project, Paul can involve children in building a static clay oven. For safety reasons, baking is only demonstrated. 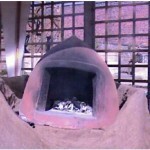 We use our portable clay oven and the curfew over the hearthstone for leavened bread. 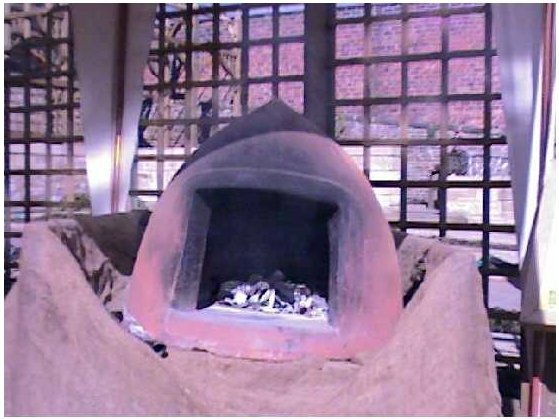 Flat breads can be cooked on an open fire, either on a griddle or the hearthstone. This option needs facilities for an open fire. 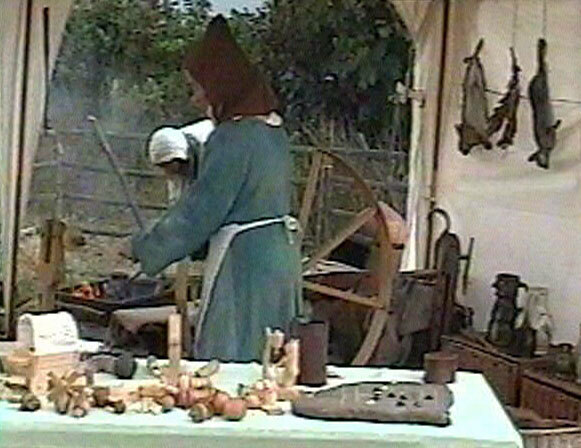 The produce cannot be offered to the public for tasting. 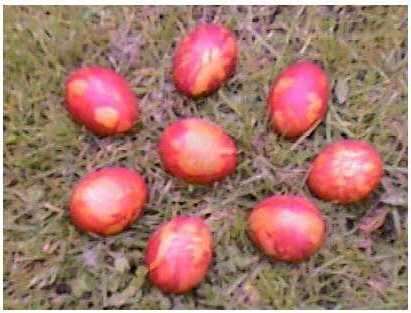 Pace Eggs are hard boiled eggs with patterned shells, they are traditional to the northern counties at Easter, with local variants in the name, such as Paste Eggs. The background colour is provided by onion skins, with designs created by leaves and flowers placed next to the shell. 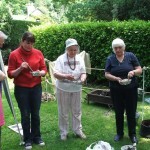 This activity requires facilities for boiling water. 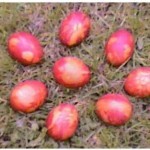 The Pace Eggs were used for games such as egg rolling, trundling and jarping. These were social means of breaking the eggs for consumption. 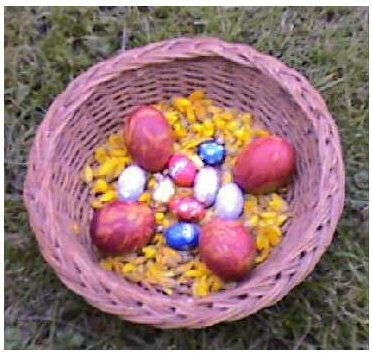 Our modern Easter Egg hunt involves finding a hidden Pace Egg for a reward of chocolate. Writing was not the universal skill in the past that it is today. The scribe was a craftsman. 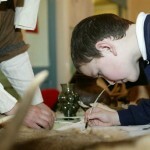 We look at wooden writing tablets, styli, parchment and quill pens. 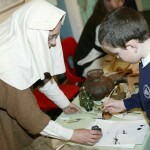 Children can try writing on a mock wax tablet with a stylus and on paper with a quill pen and ink.